We are in the buying and selling mode once again, as we prepare for our move to New York. We’ve prepped our house for sale–painting, yardwork, and other small details that needed to be done. We just put it on the market, and we’re ready for buyers to come through! I want the very best first impression for anyone that comes into our home, and there are five simple things that I do every single time a potential buyer is going to see our home that I’ve found to make a huge difference. They can be done in around 15-20 minutes, so even if you have a last minute showing, you can pull these off! If you’ve ever walked through a home that’s for sale, you know that first impressions stay with you–good or bad. The homes that smell good, look neat and clean, and are well presented are always the ones that stay on my list. I also have six kids, and trying to keep a home completely clean and straightened is a challenge, but it’s important to me, and it’s all worth it when that sold sign goes up!!! I stick to my cleaning routine rigorously, because I know the extra effort will pay off in the long run. 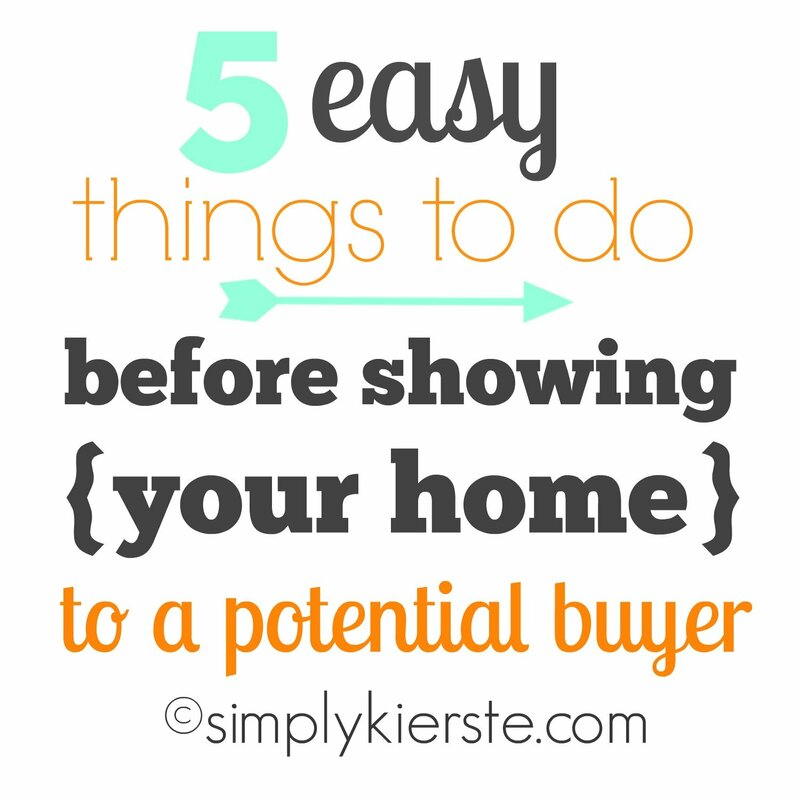 I want to be ready for the call that someone wants to see our house, even if it’s short notice–and not panic. First, I recommend keeping your home basically clean all the time. I KNOW!!! It can sound overwhelming, but I believe SO much in the maintenance method that I know it can be done. Wiping down bathrooms, vacuuming a little more often, keeping the kitchen floor swept and mopped if necessary, picking up the playroom often, and keeping clutter to a minimum will give you a good base. It doesn’t have to be perfect all the time, because that’s impossible! But…if you keep it basically cleaned and straightened every day, and maintain your cleaning efforts, it will actually be easier. I’ve also had friends who work or have limited time at home hire someone to do a big, one time cleaning–then maintain it from there. 4. Make it smell good!!! Even if your house is clean, clutter will distract people from noticing that it is. The kitchen counter especially should be free of papers and other items. If you’re in a hurry, keep an empty laundry basket on hand, so you can run through the house and throw in anything that’s on the floor or counters. We do cleanups every night before the kids go to bed, so I don’t have to worry about their rooms (they don’t play in them, or keep toys there). When they leave for school, I shut their doors, and I know that room is done. One last tip…thanks to reader for reminding me to mention it! I like to leave out water bottles and a treat–chocolates, or something yummy! It’s one little extra that will help people remember you. I’m trying to sell my house right now, too, and these are great tips. I’ve never tried baby oil on the kitchen sink, but I will tonight before our showing! The smells are the hardest part for me since I am in the house all day. I usually have to go outside for a few minutes, then come back in and take a big whiff just to make sure nothing is funky. I also do a quick walk-through and look at all the switch plates and door frames. I have two little kids and I am amazed at how grimy those get in just a day or two! Oh yes–those darn light switches (and the wall just under them) definitely gather grime very quickly at our house too. It seems like I’m always wiping them off! Good luck with selling your home, and the showing tonight!!! Kids rooms with no toys? Have you posted about this? I’d love to know more! Playroom? Do you have a limit for each kiddo? Sooooo curious! I haven’t posted about it, but I need to! We do have a playroom, and all toys are kept in there. The only exception is for my girls, and their American dolls, which are kept in their room. Little brothers could really wreak havoc on those. :) I don’t have a limit for each child, but I consistently monitor how many toys we have, and try to add to their favorite collections for Christmas and birthdays. (Legos, lincoln logs, trains, small cars, etc.) I have large tubs with rope handles that are perfect for most toys, and I love them for larger items like big cars and trucks. They’re labeled so it’s easy to put toys away. I keep smaller items in clear plastic bins that are also labeled–Polly Pockets, Barbies, Lincoln Logs. etc.) We built a large shelving unit that goes across one wall of the playroom, and all the tubs and bins fit on the shelves. The very top shelf is for large items like Fisher Price houses, farms, and race tracks. It really works for us!!! I would love to see your playroom and the shelves you built! Hope you do a post on this before you move, or at least take pictures to write about it later. I really need to see how I could implement this idea in my house…not having toys in the bedrooms. Good luck with selling your house and the move! Exciting times for your family. Great tips!! I hadn’t heard of the baby oil in the sink…genius! I hope your home sell quickly! Thank you so much, Crystal, I appreciate it!!! We are also in the process of selling our house. What’s your favorite scentsy smell? Also, do you leave a treat and water bottles on the counter for potential buyers to enjoy? Good luck with your adventures! I have two favorite Scenty smells: Coconut Lemongrass and Clove & Cinnamon. They are both AMAZING!!! I do like to leave water bottles and treats, in fact, I’m working on a tag right now to add to water bottles for our showings this weekend! I’ll post it early next week. GOOD LUCK to you too!!!! These are great tips, Kierste! As a Realtor, it’s so much easier to show clients homes that are cleaned up and look to be well taken care of! Just one word of caution, be careful with too strong of scents because sometimes it causes buyers to wonder if the scent is trying to mask something. It isn’t very common, but I have had clients ask if there is a cat odor or such that the strong candles are trying to cover up. And I echo the idea of leaving treats, even a bowl of chocolates, because everything is better with chocolate. Best of luck with your sale and move! I just want to give out a tip that our realtor had suggested which I thought was genius. She said to put a few drops of scented oils on your air filter in your furnace and turn your furnace on, whether it be just the fan, air conditioning, or heat. It smells up your entire house instantly in every single room. I even do this anytime we have company. Its genius!